What Is It Like To Dine at Blue Hill at Stone Barns? One reason we’ve been able to dine at Blue Hill at Stone Barns as often as we have—is that it’s fortuitously located just four miles from home. Otherwise, it takes some effort to visit this world-class destination (ranked 11 in 2017 among the World’s 50 Best Restaurants). In addition, reservations are hard to come by. Often JUST called “Blue Hill” (actually the name of its older sibling restaurant in Manhattan), this one-of-a-kind restaurant is planted on the grounds of a rolling, 80-acre, four-season farm—located off a two-lane road in Pocantico Hills (a tiny hamlet in Westchester County, New York). The land it sits on has a long and rich history interwoven with that of the Rockefeller family. The spacious, contemporary dining room occupies what was once the family’s dairy barn. The room accommodates about 75 people at a sitting; the tables are so nicely spaced that you forget you have neighbors. Food enthusiasts flock to Blue Hill because the moniker “farm-to-table” isn’t a mere marketing ploy. Here, the concept is literal. In fact, you can see the fields and pastures that provision your meal outside the dining room windows. When our friends, Suzanne and Craig Stavert (Adventurers of Empty Nesters) from Pasadena, California, recently visited, they provided the perfect excuse to return. What is it like to dine at Blue Hill? Always a first-time experience! The New American menu changes not only seasonally but also daily. Depending on what and how much of it is growing on the farm or stored in the larder, your meal may even be different that that of other diners around you. Are you willing to leave menu choices to the Chef? As alluded to previously, the food at Blue Hill celebrates each growing season. There are no menus, per se, and few choices. Before you arrive, you’ll be asked whether you have any food allergies, sensitivities or aversions. Once seated, you’ll receive a small journal called “Field and Pasture” that offers some month-by-month hints of the types of foods and ingredients you’re likely to find on your plate. Being introduced to new ingredients and inventive (and often, whimsical preparations) you’ve never had (or imagined) before requires some degree of flexibility and willingness to try new foods. Do you enjoy small bites? The number of “courses” served is typically so plentiful (some 20-30 courses or more) that you’ll probably lose count during your feast. Trying to recollect them afterwards will be even more of a challenge! Portions are large enough to offer you a real taste but not too large to spoil one’s appetite for what comes next. Another example of the mindfulness of the kitchen: Patrons are discouraged from stuffing themselves with the very delicious (baked on premises) breads before their meal; instead, bread is served as one of the later courses. If you’re looking for a 16-ounce aged steak with an oversized baked potato, this isn’t the place. Are you willing to use your fingers? Yes, the first several courses are foods intended to be eaten with fingers rather than utensils. Because the silverware settings arrive afterwards, you don’t have a choice. Your meal will likely start with a parade of fresh and flavorful baby vegetables from the farm. The strategy is disarming. Like a potent cocktail, these veggies simultaneously serve as a social lubricant and relaxant. Although the dining room is elegant and the service attentive, the mood remains decidedly relaxed. (Blue Hill at Stone Barns won the 2017 James Beard Award for Outstanding Service), a credit to the committed team led by Operations Manager Philippe Gouze. Are you open to being taught about your relationship to food and the earth? 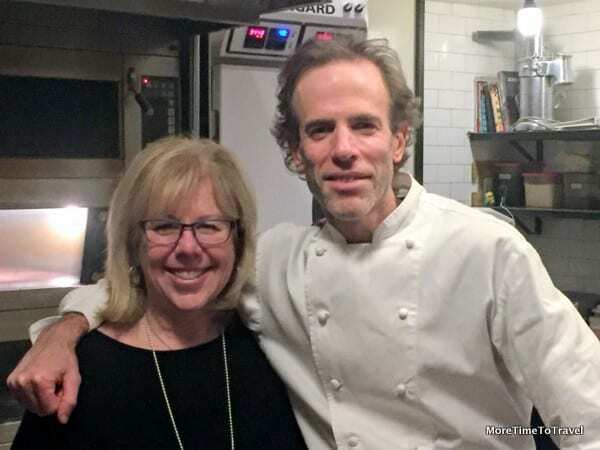 Chef Dan Barber has transformed the roles of wait staff to that of knowledgeable food educators and mentors. They describe every dish set on your table, are able to tell you from which of 65 local farmers or foragers they’ve been sourced, and explain the relationship between the food and Stone Barns Farm. Courses are largely vegetable- rather than meat-centric. Many veggies come to your table with a fascinating breeding history. For example, our server Ronald told us that our habanero peppers were the result of three generations of breeding, aimed at making them less spicy. The NY 150 potatoes we ate were bred to be creamy. Chef Barber believes that chefs and their culinary teams can play seminal roles in teaching people how to eat so there is minimal waste and foods, therefore, remain sustainable. Do you have the time and patience to dine leisurely? A meal at Blue Hill at Stone Barns isn’t rushed. Rather, it’s intended to be slowly savored over the course of 3 or 4 hours or more. The service is like theater; the presentation of the food is an art form—from the creative plating to the polished service and presentation. Exceptional meals like these come at a price, albeit a fixed one. The cost of dinner is $258 per person; wine pairings are an additional $168 per person. Like some other fine restaurants, Blue Hill at Stone Barns has a no-tipping policy. Instead, it charges a 20 percent administrative fee that is shared by service staff. Blue Hill at Stone Barns has perfected the recipe for creating a dining experience that is joyful, entertaining and educational. And, of course, good meals like this one are always enhanced when you share them with good friends. The proverbial icing on the cake was when Chef Barber invited us to a between-course tasting in his bread-making laboratory, providing an opportunity not only to taste his unique wheat breads but also to thank him for a memorable culinary experience. Directions by train: Take Metro-North Hudson Line from New York’s Grand Central to Tarrytown. Hail a taxi at the station for the 10-minute drive to Blue Hill. It takes a good 50-minutes to “Uber” to the restaurant from midtown Manhattan—and longer by Metro-North railroad train, which requires a taxi afterwards from nearby Tarrytown. Reservations are usually tough to come by without advance planning. Reservations can be made on reserve.com. OMG the food looks amazing! I love small plates and finger food, and everything here is just so beautiful. I definitely want to try this next time I’m in New York! It sounds like dining at Blue Hill is more of an experience than what we would typically call a meal—albeit an experience that leaves one’s stomach and all 5 senses sated. It’s definitely not the kind of meal you would want two nights during the same week:-) But it is so much fun to go during different seasons! I’ve answered “yes” to all questions! Hesitated at time and price questions, but for this kind of experience at Blue Hill, I’d make time and live it up. Wish I was a local. This is an experience of a lifetime. I was also giddy with delight to meet and talk with the man himself, Chef Dan Barber. Thank you to Irene for making this connection for us. All of the staff at Blue Hill at Stone Barns are exceptionally talented and so kind. It was a magical evening. We were so happy to share the “magic” with you and Craig! I used to sell seafood, and Blue Hill at Stone Barns was one of my clients. Although I never got to eat there, I did get to sample many of Chef Dan’s dishes at some foodie events in NYC. His artistic mastery of his artistic medium (yeah I called cooking an artistic medium) is unparalleled. Glad you live so close! How neat! You are a true Renaissance woman! I marvel at all you’ve done! Well, Blue Hill at Stone Barns looks quite lovely. 20 to 30 courses? Goodness. That food looks amazing – it would almost be worth going just to look at it! Not sure which I liked the idea of the most, the brussels sprout tree or the squash brulee. The brussel sprouts tree was so much fun! Oh my my … This looks like such a beautiful, rich experience. Everything looks like a work of art — and I love the autumn-ish appeal of the presentation, including the pumpkin, squash, and the leaves used. Definitely on my destination list, Irene! Happy New Year to you, and I wish you many more of these amazing culinary adventures! Thanks, Cindy! Hope this whet your appetite for a visit to New York! P.S. Cute photos of YOU too! Blue Hill at Stone Barns Looks like a fun and interactive dining experience that’s grounded in fine culinary technique and quality ingredients. The Brussels Sprout tree to chop down is genius! One dish is as creative as the next!